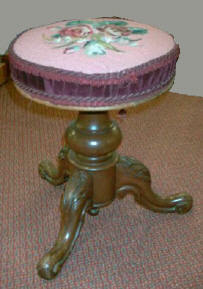 Victorian Revolving Piano Stool with nice turned legs. 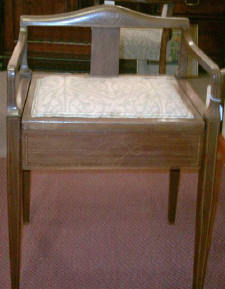 This light mahogany stool has a small inlaid back rail, the seat has a new cover and lifts for sheet music storage. 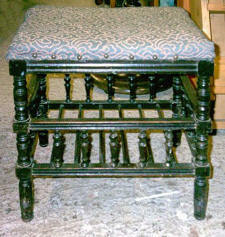 This is an excellent example with very attractive carved and turned base and attractive tapestry seat in good condition. Attractively turned spindles finish off this neat stool with handy shelf underneath. Dark and light woods available, with interesting turned legs. Useful for a hallway, plant-stand or a seat for a treasured doll. At Pitmedden Furniture Workshop our stock of stools, footstools, etc is constantly changing and it is not possible to show all available items. 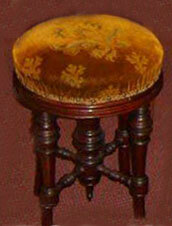 The photographs are examples of stools which we have in stock or which we have recently sold.